Another 'Get Dirty' clean up took place in Skelmersdale this weekend and despite the rain 30 volunteers grabbed litter pickers and set about cleaning up litter hot spots on the Ashurst estate. 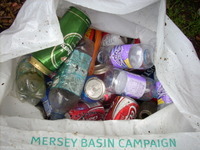 We decided to something a bit different at this clean up, something which we should really do at every clean up...we separated cans, plastic and glass bottles so that they could be recycled. It was shocking how many cans we found, and Vodka seems a popular tipple judging by how many bottles we found hidden in the trees! We found the usual tyres, motorbike parts, TV, crisp packets and after a hard mornings picking we had a hearty lunch of bacon butties and homemade buns provided by some lovely ladies from the Residents Association. All in all it was a good weekend, watch this space for the next 'Get Dirty' clean up.